This page has printable chore charts, housework schedule, Christmas card registry, phone numbers refill, and project planner for your household planner book or homeschool planner. This file is in word format, save it to your computer and customize it to suit your household. This list is the result of me spending years of household management observations/studying and years of experience in making practical forms. Please do not remove copyright. Edit this form to suit your household and use it for your daily, weekly, occasional, and yearly tasks. The Morning-Noon Chores: are the everyday repeating chores. Adjust this list to suit yourself. The Weekly Chores are to be done sometime during the day after the morning chores are finished and on specified days of the week. The 3-Month Checklist have chores that need to be done throughout the year. These are chores that are not necessarily done every 3 months and not as often as every week. Tip: The Morning Chores Write the morning chores on an index card and post it in a location that you will see every morning. Keep it until the morning chores become habit. Do the same for your children's morning chores. My children's chores were posted on their bedroom door and they saw it every day before leaving their room. Open Word, create a new document and in Page Properties, set the paper size to the size of your index card [ex. custom setting at 3.5" x 5"] with .5 margins all around and copy this morning daily list to it. 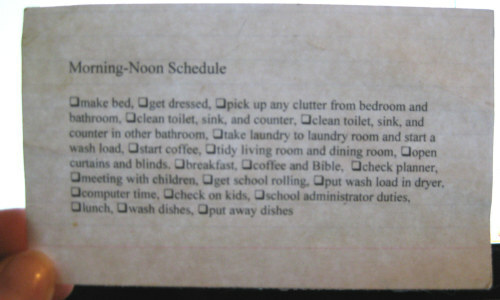 Print on an index card to have handy until you memorize your daily morning chores. This is my old card. After a while this little routine became a habit. Now that our homeschool is complete, I have had to create a new routine for myself. It seems that I have replaced homeschooling duties with working on this web site. Lab Write-up - I've been sitting on this page for a while. I had bigger plans for the discussion of labs, but they remain unhatched.